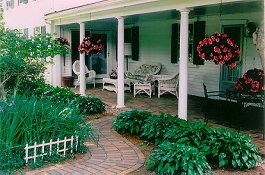 The Candleberry Inn bed and breakfast is located in the heart of Brewster, an historic sea captains' town on the quiet north side of Cape Cod. The elegantly restored, 250 year old house is on 2 private landscaped acres of award-winning gardens. It is a five minute walk to the bay beaches, antique shops, galleries and dining. Miles of nature trails and bike paths are close by. Wide floor boards, antiques, and oriental carpets can be found throughout the Bed & Breakfast Inn. The nine large, sunny guest rooms all have private baths and air conditioning. Working fireplaces in three rooms and two luxury suites, one with jacuzzi, offer a variety of room selections. There are two common rooms, a large porch overlooking the gardens, and comfortable swings for your relaxation on the lawn. Rates range from $115-$215/night depending on the season and room. Weeknight discounts are available for extended stays. 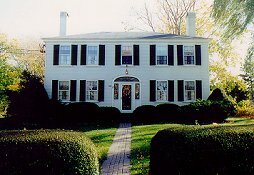 This and other Cape Cod Bed and Breakfast Inns can be found here in The Register. Romantic Country Inns, Getaways and B&Bs offer a great Brewster lodging alternative to big hotels.